Jordan Lake can’t catch a break. The drinking water reservoir for 300,000-plus people receives the brunt of human folly: industrial chemicals that sidestep available wastewater treatments, agricultural runoff in the form of fertilizers and feces, and yes, human excretions, along with contaminants that we pour down our sink drains. 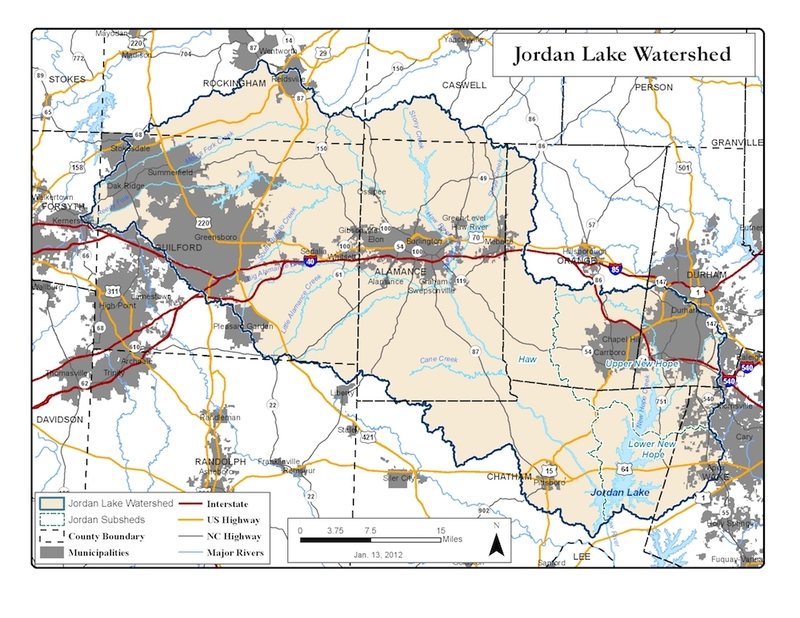 An interim report on nutrient management in Jordan Lake reveals that of the many contributors to the reservoir’s problems, home septic systems in the watershed are a main culprit. And as the once-rural watershed has become more urban over the past 20 years, discharge from more of these systems is feeding the harmful algae in Jordan Lake. “Residential developments on septic systems represent an ‘unlimited’ source” of nutrients such as nitrogen and phosphorus, the report says, versus other limited nutrient sources such as farms. The interim report, delivered to the Environmental Review Commission in December, was produced by UNC System scientists hired by the NC Collaboratory, a think tank housed at UNC Chapel Hill. In the 2016 budget bill state lawmakers appropriated the Collaboratory is receiving $500,000 annually over six years to study pollution sources and to identify potential solutions to the contamination in the Falls Lake and Jordan Lake watersheds. The first three years of the study focus on Jordan Lake, culminating with a final report by December 2018. In densely developed areas, heavy rainfall can wash nitrogen, phosphorus and debris into the lake, bypassing stormwater treatment and controls. Nitrogen and phosphorus — also known as nutrients — are known to stoke the growth of algae in waterways, particularly in warm weather. Some types of blue-green algae are toxic to humans, birds and animals. But even more benign versions create problems for municipal water treatment plants because removing the algae from drinking water requires additional expensive treatment. Lawmakers passed Jordan Lake rules in 2009, against the wishes of the real estate and homebuilders’ lobby. Since then, enforcement of the rules has been delayed. Meanwhile, since 2010, five of the 10 fastest-growing cities in North Carolina are within the Jordan Lake watershed, according to the UNC Carolina Population Center: Durham, parts of Cary, plus Greensboro, Morrisville and Apex. Scientists working on this Jordan Lake study also noted that flooding and major rainstorms send a greater amount of water from Haw River arm of the lake into the New Hope section than previously believed. “It’s another piece of the puzzle,” Piehler said. “Internal sources” — the phosphorus and nitrogen resting in sediment on the lake bottom (the US Army Corps of Engineers built the reservoir over a former tobacco farm) complicate the matter. The cost to reduce the pollutants and nutrients entering the lake would be enormous — more than a half-billion to the City of Durham alone. “Stakeholders,” such as local governments, homebuilders, industry and farmers in the watershed “are not comfortable” with the fairness of the rules, the report said. Appropriate water quality standards, fragmented by industrial sector and locality, will likely need revisited. There is also disagreement about who should pay — and how much — for a cleaner lake: The polluters alone? Or also those who reap its benefits? “People need to be involved in the process that will affect their lives,” Piehler said. Steve Wall, outreach liaison for the collaboratory, said several events are scheduled for the spring, including a public forum in Chapel Hill on March 22.